When I first saw the Adafruit Joy Bonnet for the Raspberry Pi Zero I know I had to get one and try it out. 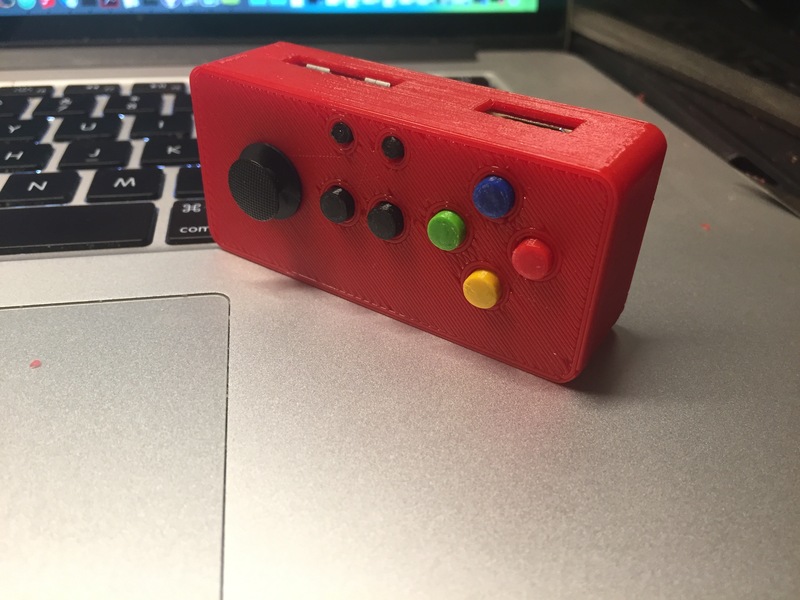 🙂 I liked the idea of having a small RetroPie rig I could keep in my pocket. As if I needed another reason to buy it, the back of the bonnet (aka hat or phat) says “It’s Dangerous To Go Alone! Take This.” — which harkened many fond memories of playing The Legend of Zelda. 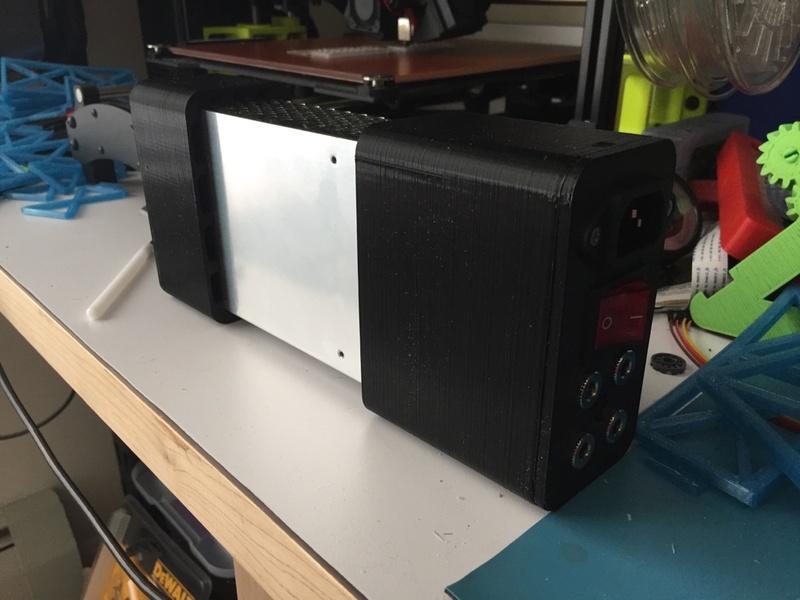 Why did you design your own case instead of using something out there already? 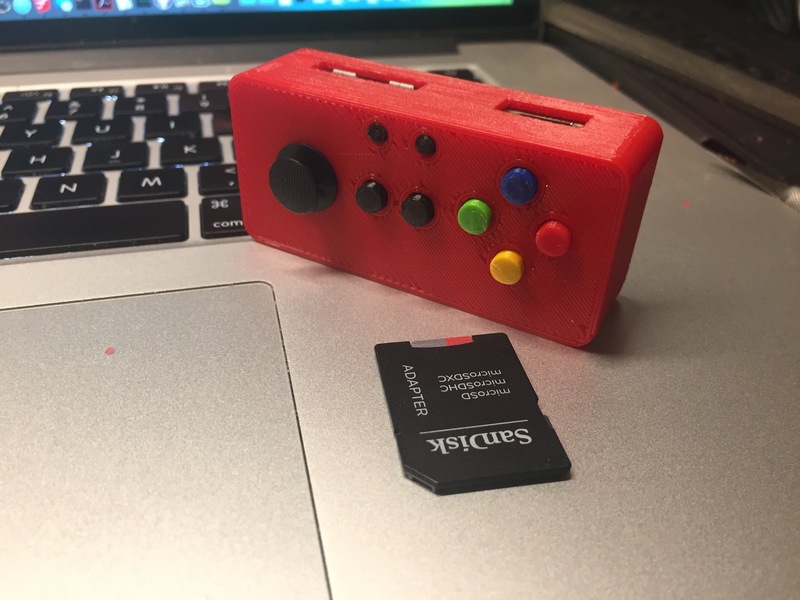 From poking around online, on Thingiverse.com etc. I saw a couple of cases for the Joy Bonnet but didn’t see any I really liked. I did try printing this model which looked like it might be fun, bit I can see why the two ‘makes’ only show the prints and not the assembled unit. 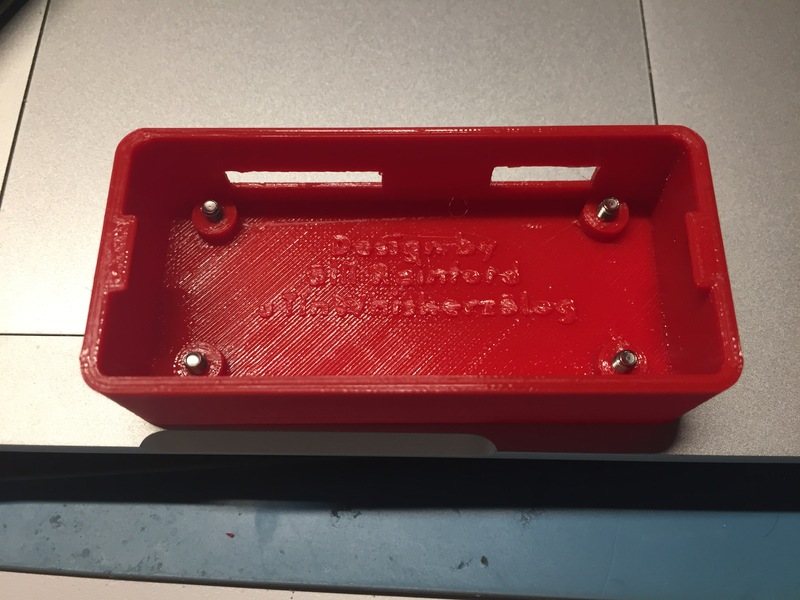 The fit and finish, even when printed on my well tuned printer was not what I wanted. I didn’t like how the top and bottom mated leaving a gap and didn’t like how the buttons felt/moved and tried post processing them by hand to improve things. I liked it in concept but not execution. A while back I designed and built this RedHat Shadowman Sign and I was quite happy with how that case turned out so I decided to use similar techniques to build a case for this Pi Zero W + Joy Bonnet setup. The first thing was to solder the headers onto the bonnet. 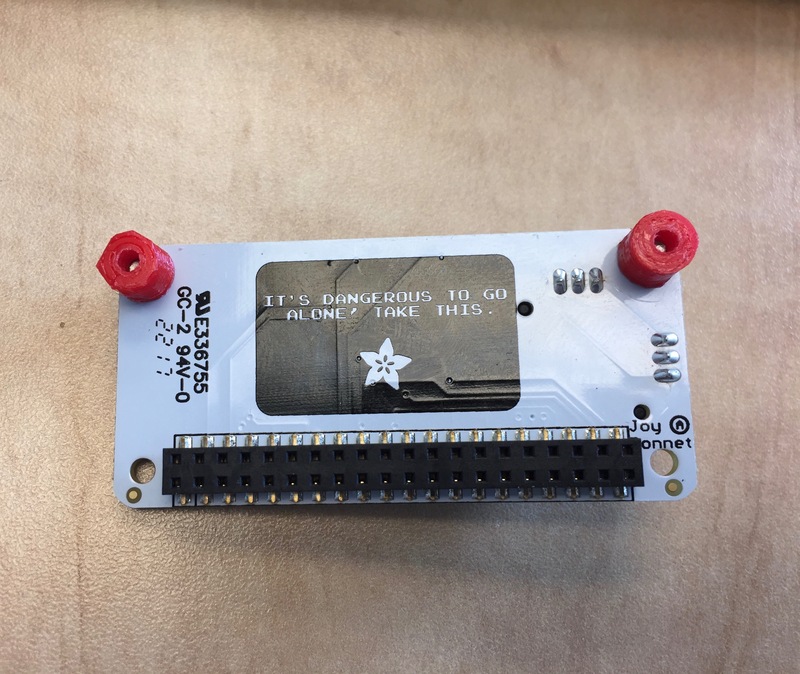 I took the regular headers and installed them upside down — meaning the short end of the pins is what I wanted to preserve and the long ends went through the PCB and were clipped short after soldering. This worked great and was the perfect length for use with the low profile female headers on the bonnet. On Adafruit.com I didn’t see any spacers of the correct height for this project ( The brass standoffs for Pi Hats they had were sized for full height headers) so I decided to print my own. You should be able to use an M2.5mm or #4-40 screw to secure the standoffs to the bonnet. I used #4-40 5/16″ long screws as that is what I had on hand and it worked out great. With the standoffs in place I was able to assemble this rig and test things out. 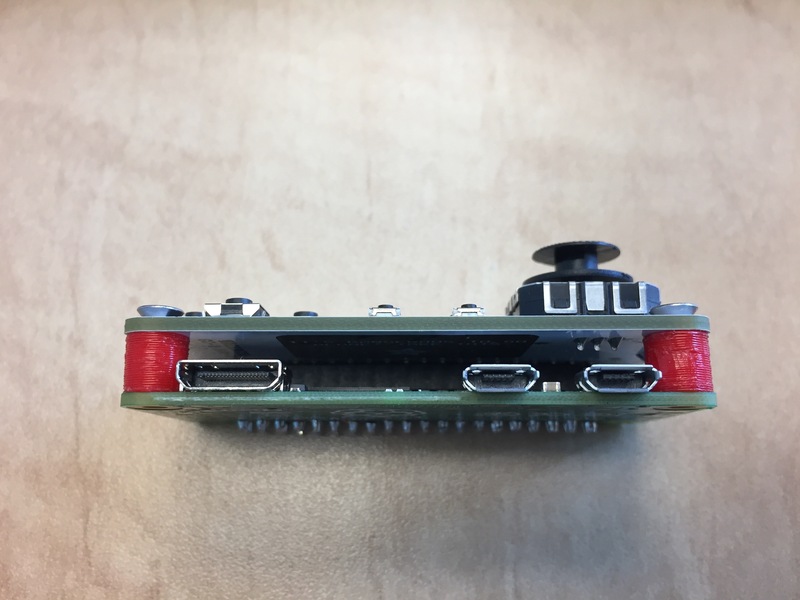 I installed the RetroPie OS (For Pi 0/1) image onto the 16GB class 10 micro USB card via ApplePi-Baker and used the HDMI and 2.5A micro USB power supply I had on my workbench. Next up I designed a case using similar design details as I’ve used in the past. (2mm thick walls, tabs that can print in place without supports and chamfered holes for the screws etc.) This was also the first time I baked my name into the model as a designer — I hope folks don’t mind that too much, plus once assembled you’ll need see that again. ASSEMBLY TIPS: Test fit your screws ahead of time and make sure your screw heads are flush with the bottom of the case. If you had some sagging, now is the time to clean that up with an X-acto knife or similar. 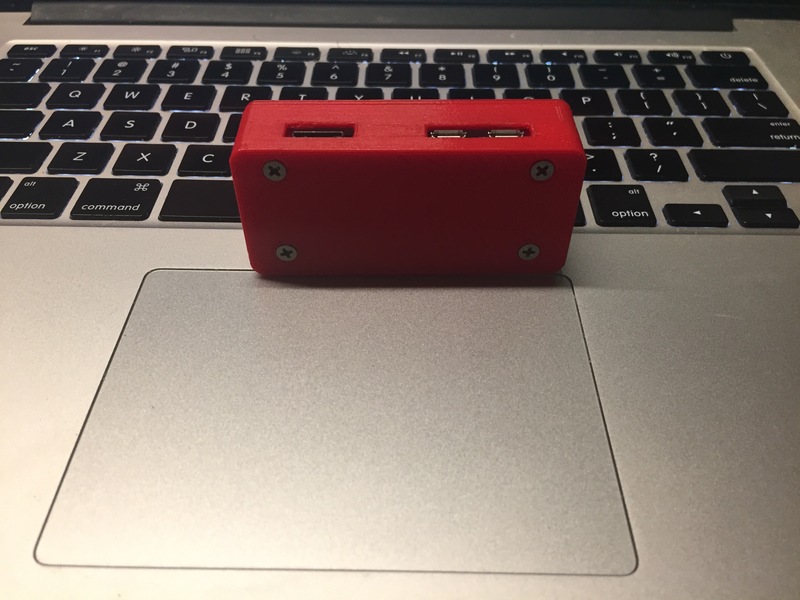 I used 18-8 Stanless Steel #4-40 screws that were 3/8″ long to attach the Pi Zero W to the case. 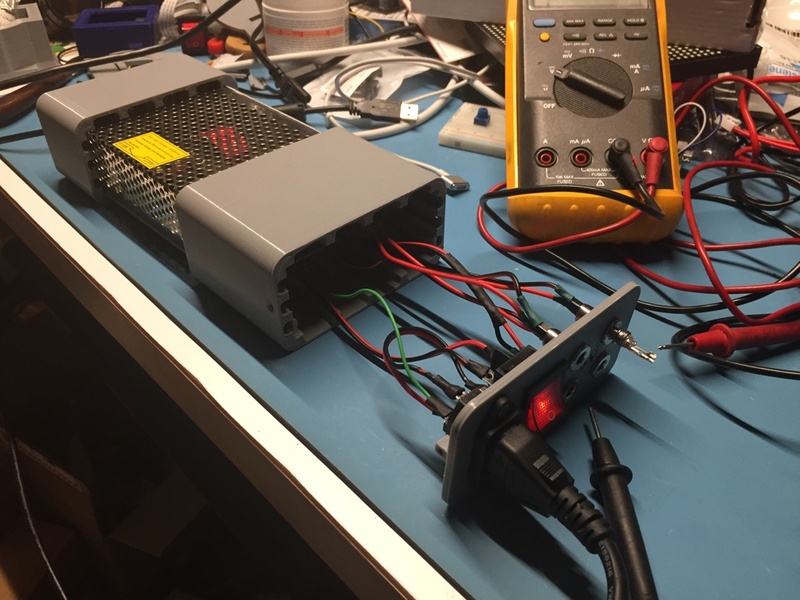 Next up was designing a lid for the case and buttons that lined up with the buttons on the Joy Bonnet. 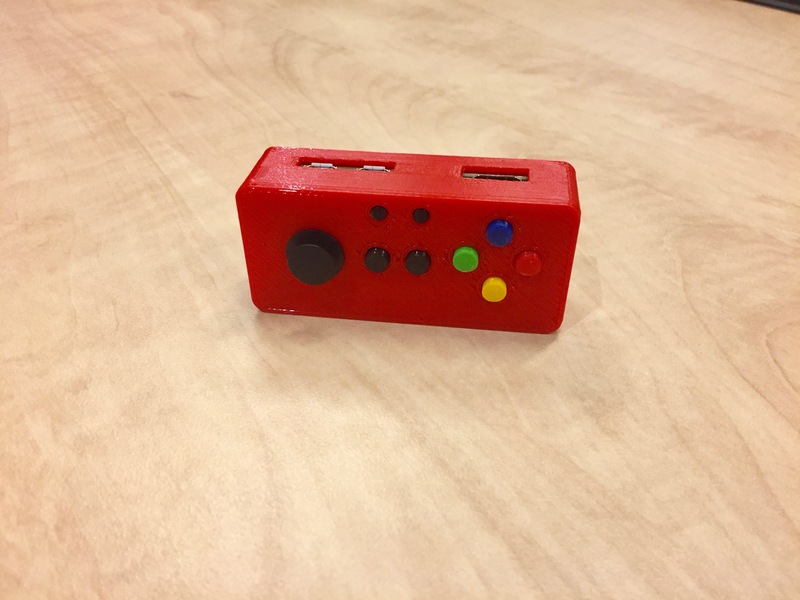 I made two or three test prints of the lid and some buttons until I got a layout and movement that felt and looked right to me. 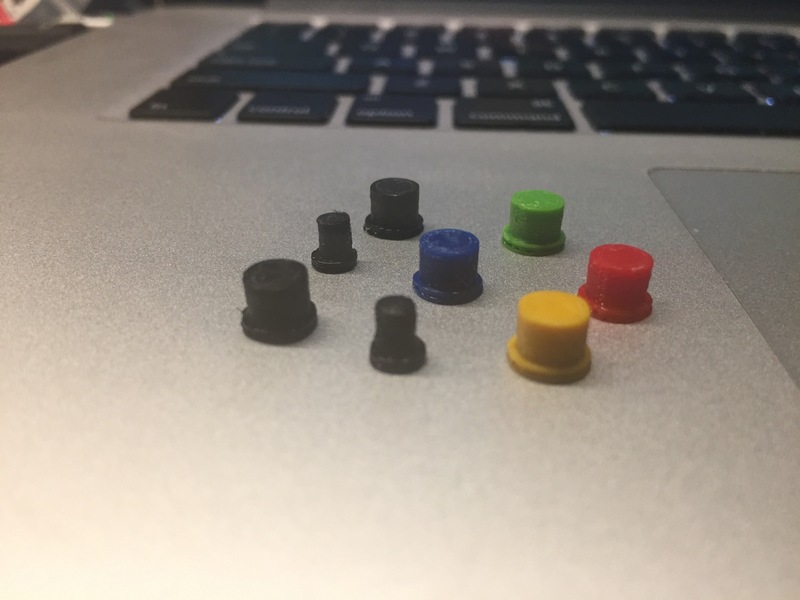 You’ll want 6 of the 5.5mm buttons and 2 of the 3mm buttons. They print in a couple of minutes so printing all the colors below was not too arduous a task. I also included STLs for buttons of a few other sizes I tested in case it is helpful to folks with printers that are tuned differently. I test fit each button to make sure there were no bits or sags or anything that would impede button movement. Make sure they move smoothly. Next test fit the lid to make sure it snaps into the case properly and is not bowed. If it is bowed make sure your print was clean and file the tabs and/or clean out the pockets/mortises (where the tabs lock into) until you have a nice clean fit. Also make sure to remove the button on the D-pad before trying to fit the case lid. I also filed to top of each button so they have a nice smooth feel when in use. Test fit all of your buttons ahead of time. Place them into the lid as shown and snap the case on while oriented this way. 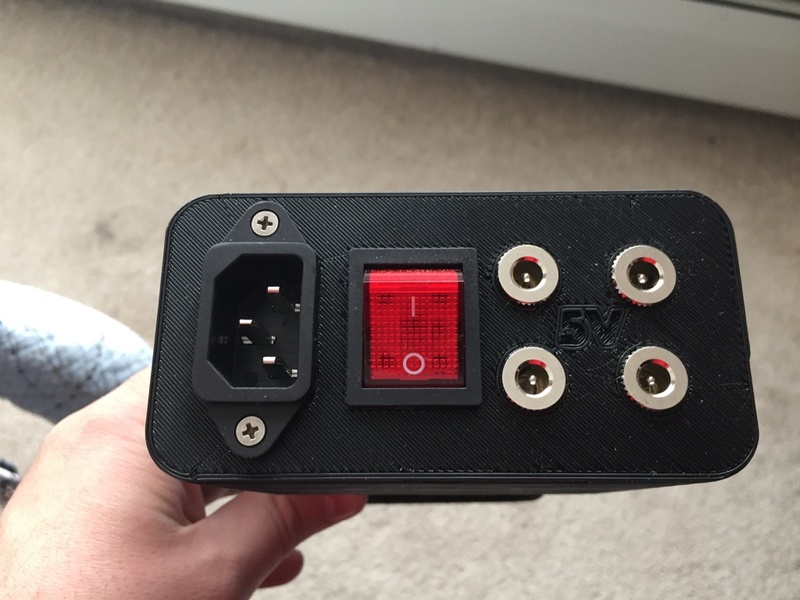 The front wall of the case (where the USB and HDMI ports are exposed) are 0.5mm thinner than the rest of the case so that the USB and HDMI cables fit securely into the ports. 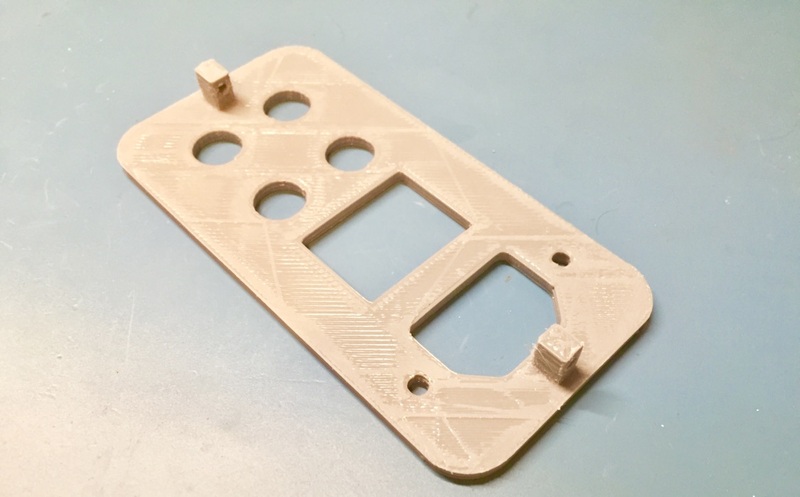 The two PCBs are pressed up against the interior of this wall and help maintain case rigidity on par with the rest of the case which is a full 2mm thick. 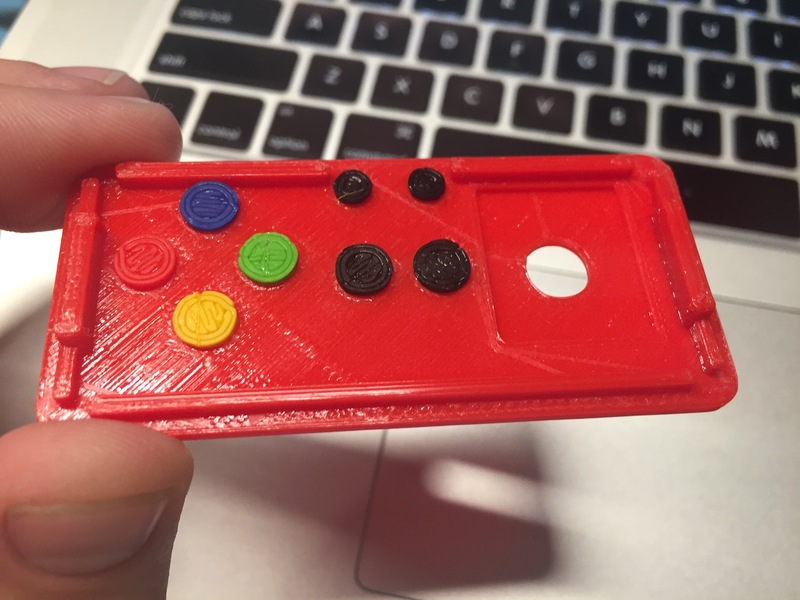 I printed the A,B,X and Y buttons in old school Non-USA SNES colors and I am happy with the results. Printed on a Lulzbot TAZ 6 printer using ColorFabb nGen Red, Dark Blue, Light Green, Yellow and Black filament at 230 degrees C. I’ve found nGen to have minimal warping and got away with not having to print a brim. The only part that needed supports was the case bottom this way the top of the port opening was nice and clean/straight. When removing the support material be careful not to clip out the vertical support between the two USB ports as I did on one of my cases. 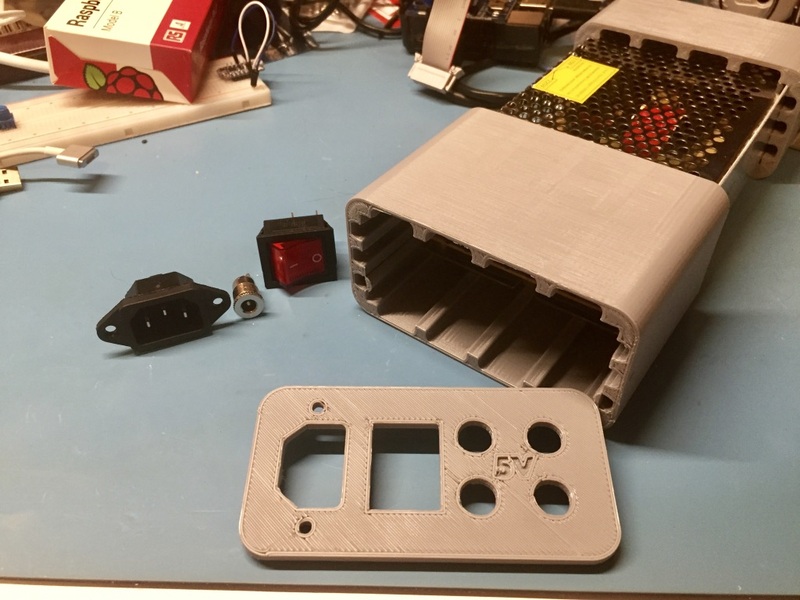 You can find the models for the above case on Thingiverse here. 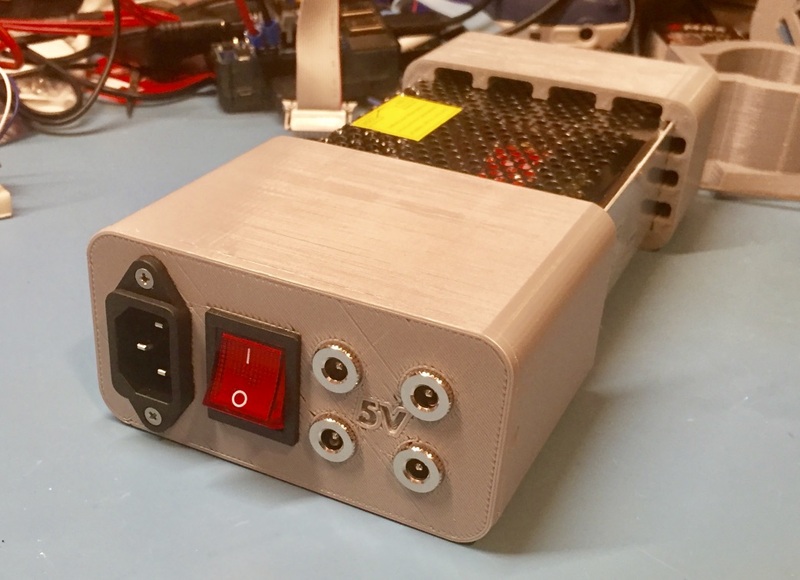 If you make a print of this case for yourself or remix it please be sure to comment here or on Thingiverse as I’d love to see what folks do with this project. Like any red blooded engineer I like nice designs, shiny objects and blinking lights. 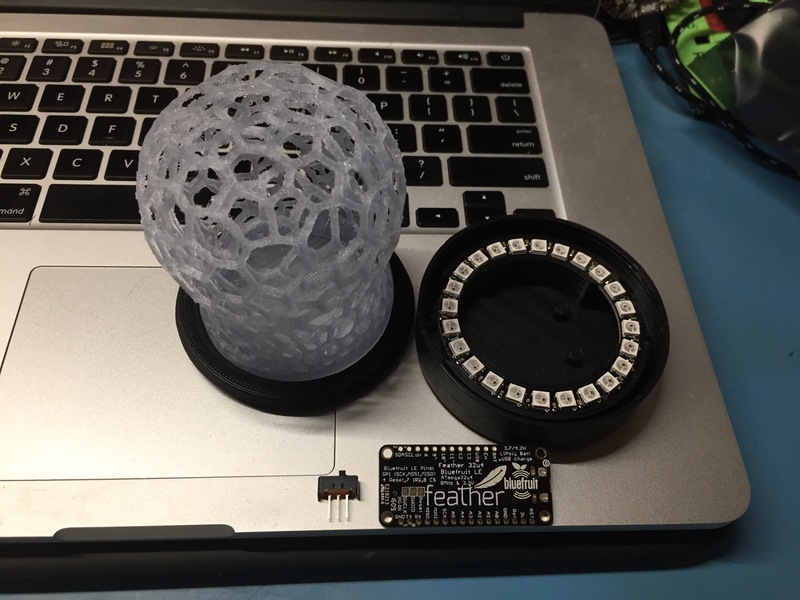 One of the projects that burrowed its way into my subconscious and helped push me over the edge into buying a 3D printer earlier this year was the Adafruit Feather BLE + NeoPixel lamp with 3D printed Voronoi Shade that plays some animations by the Ruiz Brothers over at Adafruit. 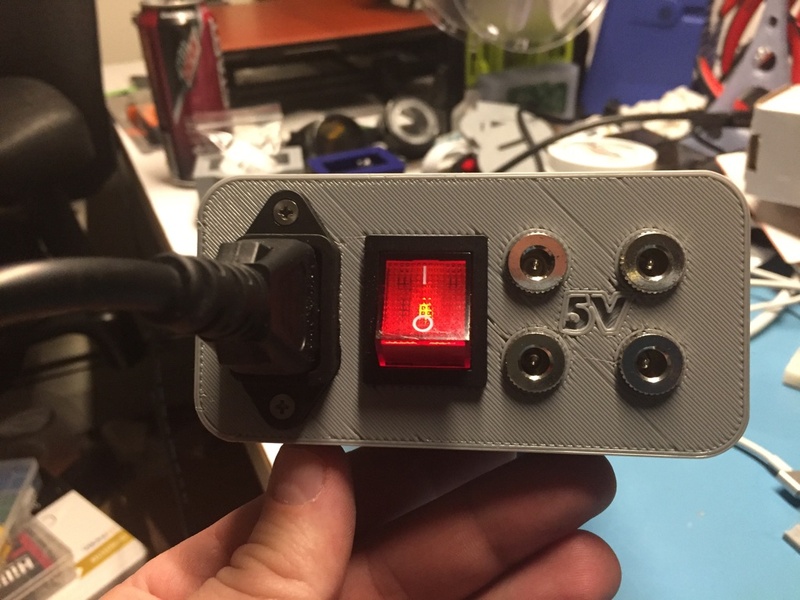 It’s a great addition to any office desk or maker workbench. After playing with the sample code which simply played a short animation when you pressed a button in the app I decided to augment the code to continuously play animations and add a few more to the mix. 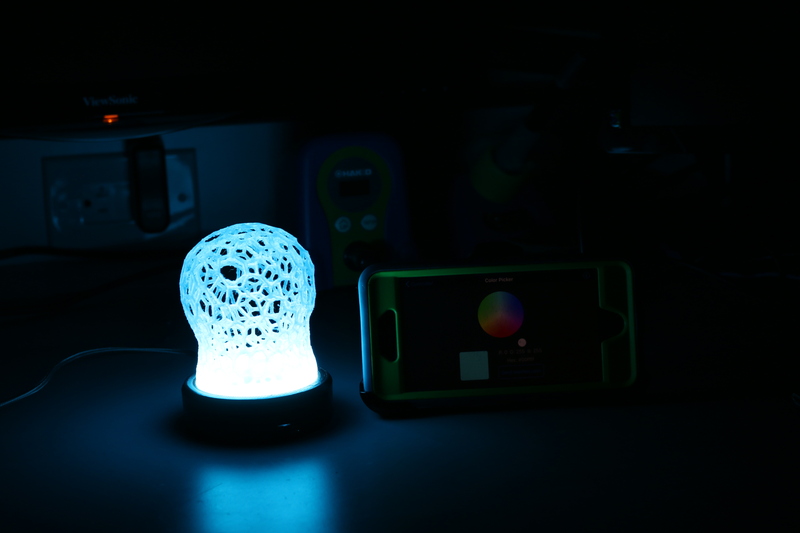 You can view detailed step/by step instructions on printing this lamp here on the Adafruit Learning System. 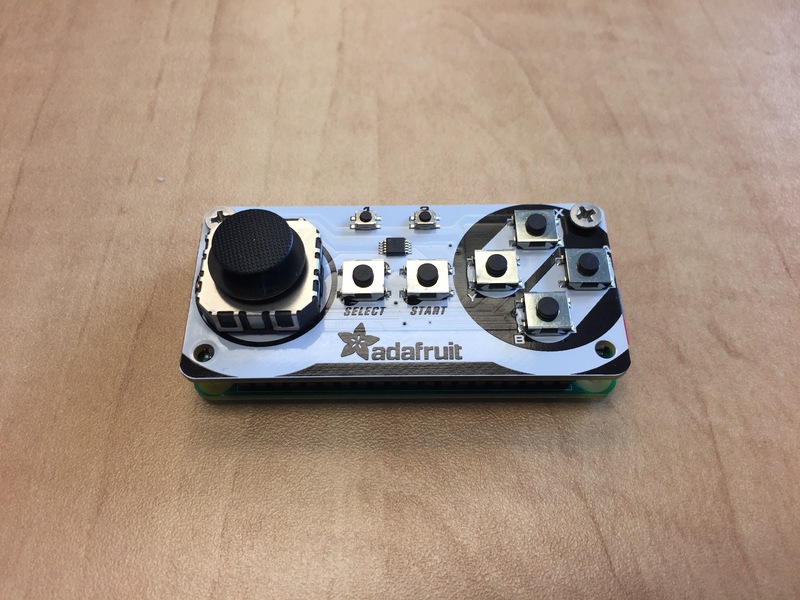 What follows in this post is a description of what changes/modifications I made to the build and additional functionality I added into the software running on the Bluefruit Feather. You can find the source code for the demo used in the video here on GitHub. I printed the base out of ABS filament and the Voronoi shade from light blue translucent PLA filament. 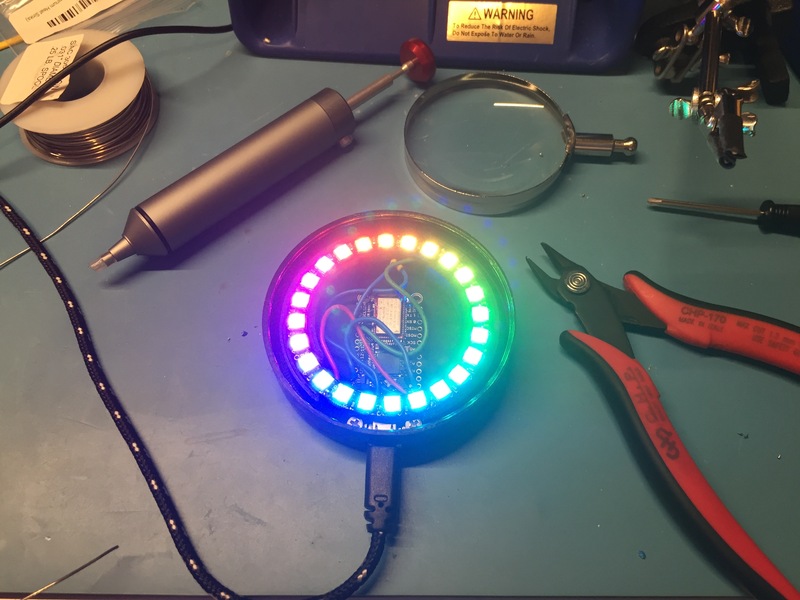 I chose not to glue the shade onto the top ring of the base as I like to be able to show off the electronics. I friction fit the clear disk into the bottom of the lampshade so it stays securely as one piece. 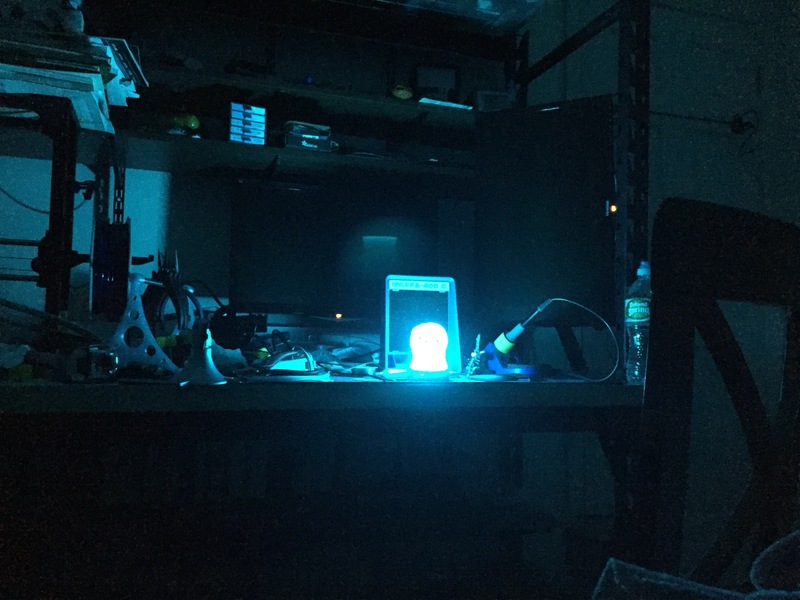 I also omitted the battery as I only plan to run the lamp in an office setting wherein I have access to plenty of USB ports. BIG NOTE: As this caused me some headaches and wasted time. In the Adafruit Learning System write-up for this lamp, make sure to follow the Fritzing circuit diagram here and NOT from the step by step photograph here. The photograph shows one of the blue wires going into ‘BAT’ and not the expected ‘3V’. 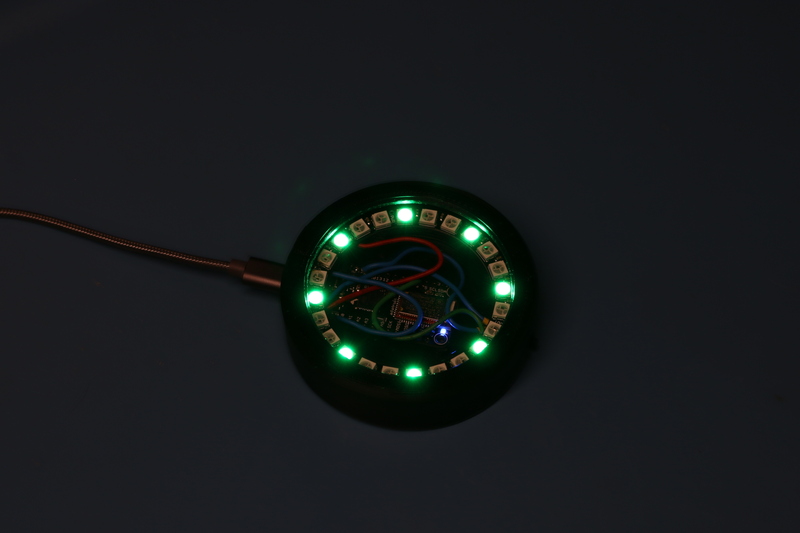 You should be powering the NeoPixels off the 3V pin. Flash the firmware and test the rig before final assembly of the case. 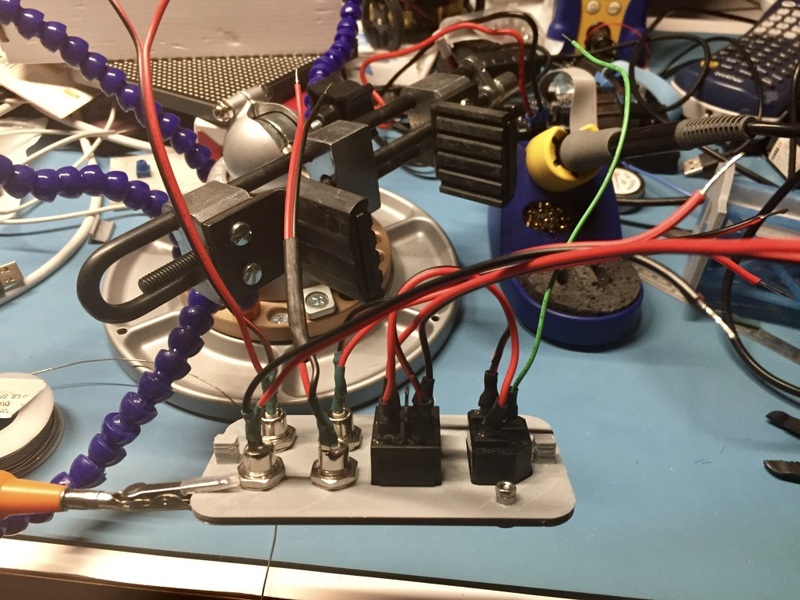 Once I finished all the soldering I fit the board, wires and ring into the bottom half of the base and flashed the firmware onto the device and made sure it lit up and worked as expected. Next up I screwed on the top half of the base and started working on the animations I wanted to use and assigned them to various buttons in the Adafruit ‘Bluefruit’ application. Last up was testing the completed lamp. 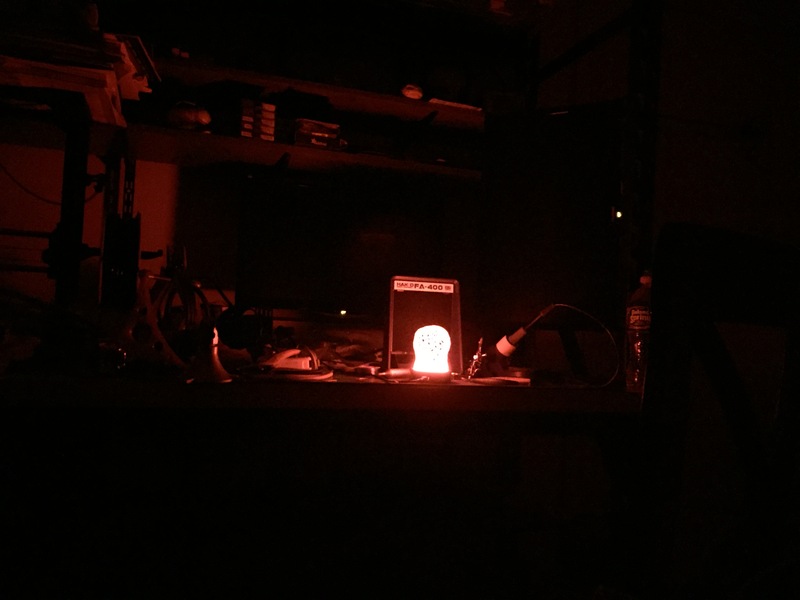 It lights up a dark room more that I expected which is nice and is clearly visible in a well lit room. Some of the animations in the above video are far better in person as the DSLR tends to blend a lot of the mixed colors into shades of white — you’ll have to see it in person by building your own. 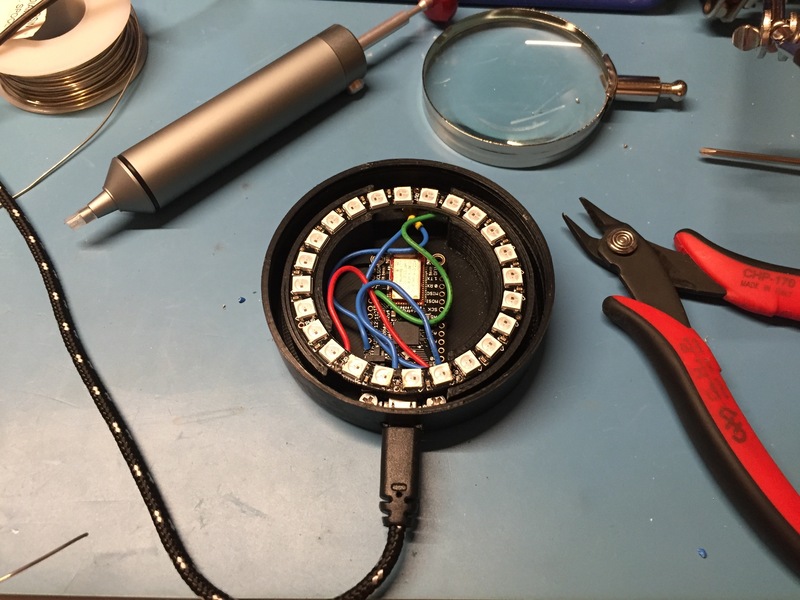 With the above lamp completed you can also tie it into the IfThisThenThat (IFTTT.com) ecosystem via Adafruit IO. IFTTT allows Internet of Things (IoT) devices to react to a surprisingly large amount of interesting stimuli — if you get a certain type of email, if your phone shows up on your home wifi network, if an IoT sensor gets a certain reading your device and react to that message and carry out your desired task — its an incredible system and will be the focus of my next post, stay tuned. P.S. 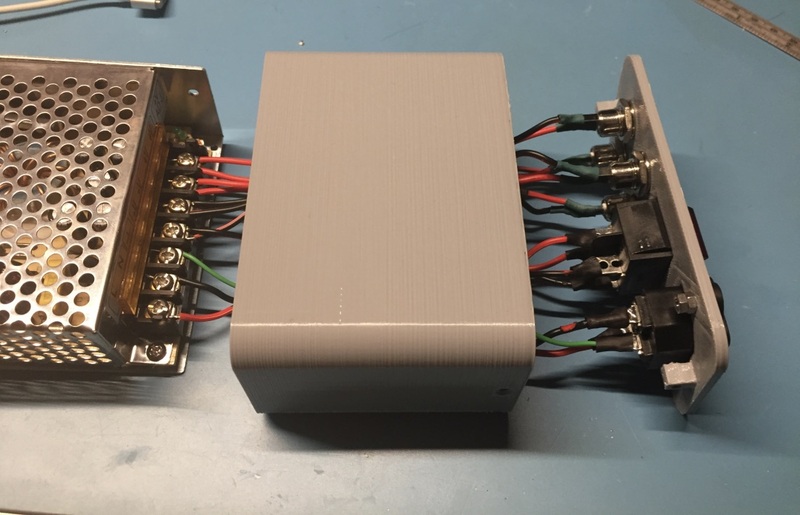 If you build your own variant of this project, please leave a comment and share your thoughts and modifications.